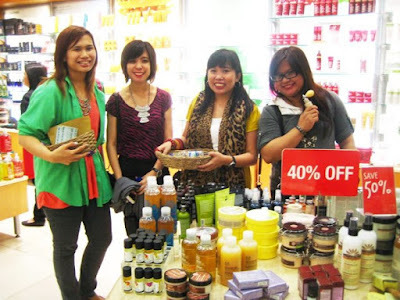 Brew of The Day: Sale Alert: The Body Shop Sale - Shopping on a Budget! Sale Alert: The Body Shop Sale - Shopping on a Budget! Hey Coffeeholics! Its payday weekend, horay! And the awesome thing about payday weekends are SALES! And yes, The Body Shop is actually on Sale Alert. In fact, they've been having this awesome sale since last moth. The Body Shop has decided to do have their SALE SEASON earlier than usual which is all good for us! You should all check out their awesome items on sale -- from Best seller products to limited edition ones! I had the privilege of trying out the stuff that was on sale at The Body Shop. We were given a budget of Php 1000 and it kinda became a goal to see what awesome stuff you can buy at The Body Shop during their sale period. Check out the all time favorites such as BODY BUTTER is now BUY 1 GET 1 FREE! Cool limited edition gift sets for sale at 50% off at The Body Shop! If you love their Candied Ginger and Cranberry Joy scents, now is definitely the time to stock up! If you love The Body Shop's bath and shower gel, grab one of those family sized huge bottles coz you get to save Php 300 when you avail of it now. Choosing what to get at a budget of Php 1000 was difficult. I was torn whether to go for makeup (but that's only almost just one item) or for the skin/bath products. Especially when several bestsellers were being sold at a huge discount. Check it out! The Body Shop Favorites - Pomegranate and Peach scented merchandise at 30% Off! Still thinking what to get then I saw their awesome eco bags! Bumped into Ana (one in green!) while checking out the items. Bumped at Jenny also while we were there. Many thanks to Rache who took some photos with me here during this event. AND thanks JEN for lending me your cam. Haha! I forgot mine so I borrowed hers. Mwaaaah! I decided to get The Body Shop Olive Oil Dry Oil Mist. She said it was one of her favorites and I knew I just had to try it myself. Product review coming up soon! And this is what I got on a budget shopping spree at The Body Shop! All that for a bit more that Php1000! That's quite a lot considering that these are The Body Shop items. I LOVE LOVE LOVE it! Thank you so much The Body Shop. And so my dear coffeeholics, if you would like to grab some awesome organic products, you should really drop by the nearest Body Shop boutique. This sale is up to April 24 so don't forget to check out their items before items or the sale times out! Also don't forget to check out The Body Shop Facebook for further news, updates, or promos by The Body Shop.